Bottomline: With Barco ClickShare CSE-200, users can share their laptop or mobile device contents on the main screen with a single click. The seamless and wire-free setup that lets even guest to join-in and share up to two users screen simultaneously. Barco is continuously enhancing its ClickShare lineup, offering seamless collaboration solution. Moving ahead, it brings another member in the ClickShare family CSE-200. We have already tested its predecessor BARCO CLICKSHARE CSM (Review) and BARCO CLICKSHARE CS-100 (Review). The next-gen device has offers enhanced security and has two buttons to pair 2 users simultaneously. Barco ClickShare CSE-200 has the same identical design, the base unit is robust, durable, and you can keep it on the table or mount it on a wall. The base unit requires a power source, whereas the USB buttons draw power from the laptop’s USB port. At the front panel, the base unit has one USB port and power button. 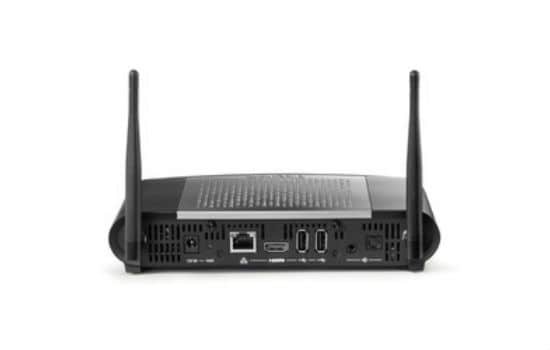 It is equipped with one HDMI, network (LAN) port, and two Wi-Fi antennas. Setting up the device is as easy as you plug USB pen drives to the PCs or Laptop. Unbox the device and connect the base unit with the projector using the HDMI cable. Power-up the base unit after fixing antennas to it. Once the base unit is connected with electricity and projector, use USB connectors to pair-up laptops and PCs (Windows or Mac) with the device. Connect LAN cable to use CSE-200 within your network and if have Power over Ethernet or PoE, then no need to add power cable to it. Else power-up the device, within a few seconds, LED light with turn into white and stop flashing. Now, you can see the ClickShare image on the screen and you are almost ready. The ClickShare CSE-200 comes with two buttons that help you to connect your laptop to screen. Add the USB button into your laptop, Mac or Windows, and click the button to replicate the laptop screen on the large meeting room screen. 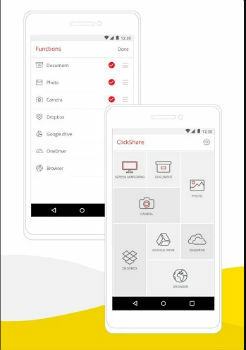 Additionally, using the ClickShare App, users can also share content from their mobile phones or tablets. It enables users to share their content in a simple click of the virtual Button from any Android or Apple device. This app enables users to easily share documents, presentations, pdf files, browser windows and jpeg images onto the meeting room screen. Moreover, data from cloud storage platforms like Google Drive can easily be accessed and shown. It offers strong connectivity for a small or medium sized room, even if you use it for a large room. Its hotspot can offer coverage of more than 10 meters. While testing the CSE-200, we connected a smartphone and cast the mobile screen. Even while roaming around, we didn’t notice any visible lag. The CSE-200 has a wider range of connectivity options including AirPlay and Google Cast support for non-HDCP content and central management. Enabling up to 2 persons to share content simultaneously, offering seamless direct connectivity to the meeting room screen. The CSE-200 lets you set-up security in three predefined levels. Last but not least, the device’s API also makes integration into the company network a lot easier.